Joshua Creek Ranch opened for guests in 1990 on some of the finest hunt country in America. Over the last 28 years, it has been developed into a sportsmen's paradise. The ranch is a rare combination of natural Texas Hill Country beauty, from fertile creek and river bottom land to lightly wooded grass pastures with intervening limestone bluffs and ledges, all managed to produce prime wildlife habitat for quail hunting, pheasant hunting, mallard duck, Texas deer hunting and turkey hunting. The hunting season is September through April, although Axis deer hunting is offered year-round. Joshua Creek Ranch is about more than just the extraordinary hunting opportunities it offers. World-class clay target shooting has been developed that includes three different fully-automated scenarios on one of the country's most scenic settings for sporting clays. Rainbow trout have been introduced in the clear spring-fed Joshua Creek to offer the most southerly location for trout fly fishing in the United States from November through May. Summer afternoons are perfect for water sports like kayaking and tubing on Joshua Creek and the Guadalupe River. Luxury lodging and gourmet dining are designed to compliment a world-class hunting experience. Comfortable lodging accommodations are situated around the ranch to ensure guests privacy, spectacular Hill Country views, and evenings around those legendary outdoor firepits. Joshua Creek Ranch was bought by Joe and Ann Kercheville in 1986. Their plan was to make the ranch a home to their herd of registered Texas longhorn cattle, but all that changed after they experienced driven pheasant shooting in Scotland in 1988 and 1989. They recognized the similarities between the Scottish hunting terrain and their own Texas Hill Country ranch, and they met many Americans who were investing lots of time and money to go "across the pond" for pheasant shooting. Their business backgrounds led them to the conclusion that there was a niche for an up-scale wingshooting destination in the heart of Texas. 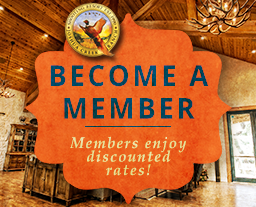 Their commitment to providing an exceptional hunting experience like what they have personally enjoyed at various hunting venues around the world, has resulted in an organization staffed with employees dedicated to tailoring itineraries that ensure a memorable experience for every guest every time they visit the ranch. The mission of Joshua Creek Ranch is to provide its members and guests with an exceptional and memorable outdoor experience. To accomplish this goal, the Joshua Creek Ranch staff is dedicated to the efficient delivery of those services desired by guests, enabling them to experience the maximum amount of time in the outdoors enjoying the activities of their choice. These experiences will be provided with the greatest degree of safety. Members and guests of Joshua Creek Ranch will always be treated with respect and courtesy. A friendly and helpful atmosphere will always prevail among all staff members. It is the goal of Joshua Creek Ranch to be recognized as "The Best."